1600 pts... I honestly don't know how you do it. The most I get is 300-and-something. Say, once I found a lasspistol, is that better than the lassgun? The readme with more modern editions answers all your equipment-information needs! Laspistols are like lasguns, but they only fire one shot per turn (not two), and give you four melee attacks with whatever melee weapon you're wielding, not three. They're better if you're about to get into CC, but worse for actually shooting. New edition soon with the ability to destroy walls (meltas have a use! yay! ), rubble-type terrain, see-through terrain that can't be moved through, a bugfix on harpies crashing the game sometimes when they drop spores, the bugfix about controls being weird right at the edge of the map, and non-functional but cool looking roads. Will soon start work on psionic creatures and powers. Oh, next time? Saving and loading. I've got them working, but haven't ported them over. Whoops. One thing I'm noticing is that items/creatures/@ generated on initializing a new map can be stuck inside of walls; @ can escape, but everything else is stuck in place (and the items are unaccessible; saw a hellspewer stuck in a wall in the starting room one game, wanted it badly, couldn't get it). Is this a known bug? Sort of! It's more of a 'latent feature' -- on Wednesday when I update the URLs and upload a new version, you'll be able to dig those lovely hellspewers out just by shooting the wall. It'll take some time, but any weapon of S4+ can do it. The bug comes in in the fact it's something that's problematic now that I just hadn't got around to fixing, even though a simple "if map[x][y].blocked == False" would have done it... my apologies! Incidentally, any bugs/other bugfixes*/weapons/features people would like to see in the next version? *Harpy spore-mine crashing and extreme north/west immobility (ie: can't move down at top of screen) bugs resolved. Also combi-bolter range was too short, bizarrely. After a somewhat steep learning curve I'm actually enjoying this slice of self-abuse (and living long enough to find some decent weapons; the glaive aquilline is quite nice, I'm finding). One suggestion; I just found my first longlas (ever) and I'm starting to realize that it's a bit broken; the 24 square spotting range puts it out of the AI-detection range of every Nid I've run into so far. Combined with its ability to wound anything and rend through armor occasionally, I find that as long as I move carefully, I can kill anything by shooting at it at extreme range while it dances around, not knowing where I am. Lethal, good for racking up experience points, but ultimately pretty dull (spacebar - click, spacebar - click, repeat over and over until dead). The correct answer is probably to extend the AI's spotting range as well, or perhaps allow any Nid to be able to spot Sarid and move towards him (or whatever else their AI would tell them to do) if he's fired at them in the previous turn, regardless of range. I agree with Eidre, for being such a simple game, you've really created a gem, I stopped playing L.A. Noire last night, just so I could keep playing this. Carnifexess, Trygons, and Mawlocs able to break through walls. Raveners, maybe? They could be a little OP though. Smoke grenades for when a Shovel-tusker charges you so you can potentially escape? Make it so that you only have to raise a weapon once (spacebar), and can continue firing it, instead of having to do spacebar, cluck, spacebar, click, spacebar, click, etc. The game is very good as it is, i'm not saying don't change it, but if it was me I'd lay back, have some milk (my equivalent of beer) and enjoy some rest after a good job. Thanks for the compliment, but Bughunt's nowhere NEAR finished-- it's still only version O.I.VII.II for a reason. By version O.II.O.O, I want most the actual features in the full-game ironed out, and to have despaghettified and commented the code; maybe even split the .py into multiple files. I want to have at least started a character generation option, with multiple usable character types (genestealer cultist, astartes, living saint) and a way to level up more than just your hit-points. I also want to add a scoreboard file, so you can keep track of how well you've done. Also a count of how many of each type of bug you've killed. By O.II.V.O, I want to have added skills and abilities-- stuff like the old stereotypical-but-undeniably-cool 'attack everyone in base contact' chainsword spin and a way to sneak that isn't just 'have a really long range'; stealth, xenology, admech stuff (aka theology), trapmaking, skinning, demolitions... plenty of them planned. By version O.III.O.O, I want to have the game able to handle leaving a map through one of the edges- it'll generate a new map, saving the old one. By version O.III.V.O, I want it to start looking like a city, with specific buildings, the ability to climb upwards or go down stairs. By version O.IV.O.O, I want to have a plot to the overall game, more background text, and an intro blurb of about 500 words. I want to start on descriptive text for clicked-on enemies that you're not shooting or grenading- long term one, that is- and finish that by I.O.O.O. I want to have all the various Tyranid enemies in the game programmed in, to have improved the AI significantly, to add traps and ambushes, location-based-events (walk over here, hear lasgun sounds to the east-- go east, PDF troops are fighting a lictor), and allies. It's around this time the game will actually, at long last, be winnable beyond getting oodles of points. By version O.IV.V.O, I want to have vehicles playing a part, and a whole different types of building material to be blown up (or not). I want to add different city-block types and NPCs, and have at least 100 items per rarity. 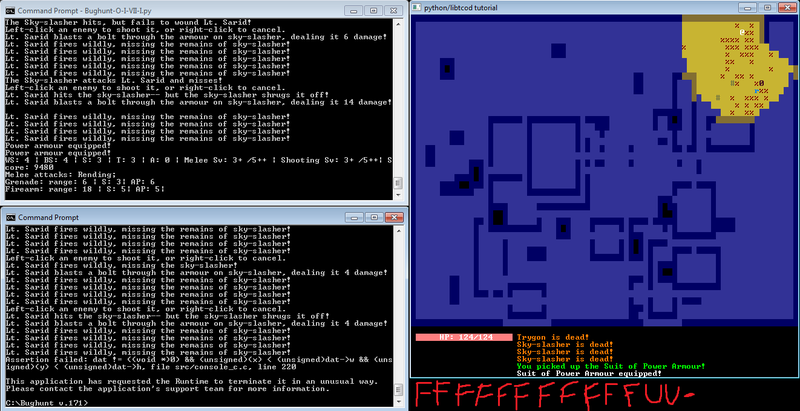 I'll likely have modified how equipment works (in code- it'll work the same in-game) by now, too. This is also the version when cover-saves will actually appear. Ammunition might, too, in guns that aren't lasguns. Vehicles will be drivable and weapon emplacements can be manned. By version O.V.O.O, I want to have added non-Tyranid enemies, if only a tiny handful- you might run into one squad of Chaos Astartes or Eldar in the entire game. These will likely be scripted. I also want spore-mines back in and working properly. This is the plan so far. It'll grow-- I've got plenty of room between O.V.O.I and I.O.O.O to add s tonne more mechanics and features. The game will evolve, become more complex, less frantic, stay very deadly but be a bit fairer, and as playable for victory as for points- and for character levelling, too ("You attained a WS 7 with chainswords?! How in the hell did you live that long...?"). The order of things might change, and features might get pushed forwards or pulled back, but it's handy to have a rough goal. It'll be along, rough road, but I'll stick to it-- I always wanted to play a game like Bughunt!... and no-one else was doing it... so I don't think I had an alternative. This is the first thing I've ever programmed-- I learned to program just to make this game. It's a clunky mess at the moment, but it's playable and fun and has the style and substance I want to continue throughout. It's hard, unfair, and a blast to play as you down tens of enemies with a chainsword before a mawloc gives you a kiss... this will never change. It's my mess, my dream game; my madness and my passion. Eventually, I'll get Bughunt! a full-on website of its own-- but I'll keep this thread updated. Maybe spread it to that other bug site and Bolter and Chainsword (once Space Marines are playable... along with Genestealer Cultists (whose end-game might be different to everyone else's) , Aspect Warriors... and representatives of every other race!). It'd be great if some of you stay interested all the way; I'm amazed even now that anyone's interested in my spaghetti. Amazed, and delighted. I'll take you up on the milk, though; there's nothing quite like moo-juice. Plus, I'll need to strength in my bones to have this to version O.V.O.O by 2013. Fingers crossed. Incidentally, I may, just may, add cows (my favourite animal) as an easter-egg interactable NPC- at the least as a walking time-bomb Mawloc homer. Well I just think it's terrific that you have such ambitious dreams and goals. I wish you the best of luck on your path, and if you ever need anything I'd be willing to help. I find it's great that you learned programming just to bring your dream game to life; it gives me hope that maybe someday I will learn about directing and producing so I can make that AvP movie that I keep thinking about (I know it's crazy, and perhaps even silly, but it don't cost money to dream ). Emergency fix: Loading a game would cause the game to crash. Fixed that. Wow, so much done in this new version!! http://www.megaupload.com/?d=ZF6ELD5T - get her while she's hot! Okay, let's see-- short and skinny; PLENTY added! - Backspace will now allow Sarid to run two squares in the same direction they last moved, if their last action was moving. It takes a turn to accelerate! Sarid also won't melee anything bumped into while running. - Walls can be destroyed with guns, grenades, and melee, by Sarid and enemies! - Some enemies will hunt you down if you get in a 'seek' range-- Genestealers, Lictors, and Harpies are the worst for this. - Saving and loading works. When you quit the game, it auto-saves-- including if you're dead! Expect a 'multiple saves' variant to exist in the future, maybe by the next version. - Monster blast weapons exist, and Sarid can get more blasts than just grenades (like the vaunted plasma cannon). - Roads exist; they're pretty. - 'Rubble' squares are left where walls are broken; they block sight, but not movement. - 'Cover' squares are see-through, but can't be moved through. - Four new guns and a new enemy (a Carnifex variant). - Now a chance of rooms-full-of-stealers. Stealers more frequent, now. C'mon! I know you can do better- first person to 10,000 makes it into the game! Captain is in my screen name. I must succeed! Around 20k points, I just started meleeing everything, and at one point I got a Harpy to kill a Mawloc. As a hormagaunt? I'm frightened. Practice makes perfect. If it helps, he makes me feel weak-- it's said to be easier for someone who designs a game to be able to master is, but... yeah. Version O-I-VIII-III, comin' right up! - FIXED THE MAP EDGE ERROR and emoved the wall around the map. Sarid no longer attacks walls randomly. - Sarid will have psychic powers by next upload!! Shadow in the Warp works against us, though. - Made it so Sarid only ever regains 1 HP when running, rather than 1-3. - Rebalanced rarities for different bug breeds; some are more common, now! - Added >>> by non-combat text in the Print screen. Helpful! - Lictors 'unveiling' will cause a new spawn very soon! - Added a new AI type, 'Harrier' - Harriers will keep in weapons range, but retreat from melee. Dakkafexes, Zoanthropes, and dakkagaunts act like this.